Don’t underestimate the importance of a good night’s sleep. Maximize your quality sleep time by using a blanket that is engineered to promote better sleep. Studies have shown that weighted blankets that are 10% off your body weight, like the Puro Down Dark Gray Weighted Blanket, can help promote better sleep. The Puro Down Dark Gray Weightedravity Blanket has a deep calming effect by simulating deep pressure touch to reduce chronic stress and anxiety. Utilizing glass beads that are sewn into small compartments, the Puro weighted blanket provides a comforting embrace to help you fall asleep quicker than ever before. It’ll help ground your body when asleep by providing a downward push. Upgrade your sleep to the next level! 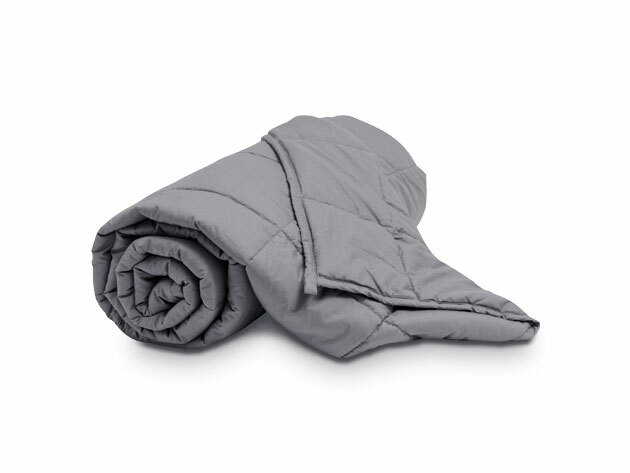 You can choose between various sizes for the Puro Down Dark Gray Weighted Blanket depending on your body weight. It comes in 7, 10, 12, 15, and 20 pounds. The shell is 100% cotton and the filling is 100% polyester. All products are hypo-allergenic, non-toxic, and completely odor-free. Upgrade your sleep to the next level with the Puro Down Dark Gray Weighted Blanket. Get yours today for just $101.99, which is 25% off the original price!